The plantation community or the people of Indian Origin came to Sri Lanka about 200 years ago. However, their parliamentary representation and equal rights with other communities had been the target of political players since independence. It is only now they are recognized and under President Mahinda Rajapaksa it has been possible for them to develop in various fields. In 1947 seven members were elected under the Soulbury Constitution. S. Thondman, S. Rajalingam, Abdul Aziz (after the demise of G. R. Motha), C. V. Velupillai, K. Kumaravel, S.M. Subbiah and D. Ramanujam represented the people of Indian origin at the Parliament. It should be worthwhile to mention that out of the seven D. Ramanujam was elected from Kandy where Sinhalese were the majority. However, before after independence the Citizenship Acts brought by D.S. 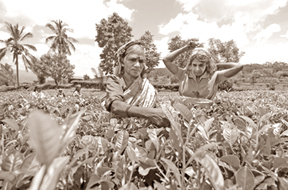 Senanayake Government the plantation community had to suffer the most. In 1948, Ceylon Citizneship Act was introduced which stated that those who born in Sri Lanka was entitled to Sri Lankan Citizenship. In 1949 Indian-Pakistani (Residence) Citizenship Act came into force and it stated that only those who were registered could vote. Thus the seven elected representatives had to lose their seat at the House. The main reason for denying citizenship rights was that the plantation community was Left leaning. Although the UNP was formed on the basis of uniting all the communities under one banner, D.S. 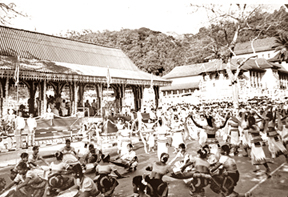 Senanayake was reluctant to accommodate the plantation community. Thus in 1952 and 1956 elections the plantation community could not elect even a single representative and most of them were made stateless. In 1960 when Mrs. Srimavo Bandaranaike became the first woman Prime Minister of the world Srimevan Amarasinghe persuaded her to appoint S. Thondaman as an appointed M.P. In 1964 under the Sirima-Shastri Pact it was agreed that India would grant citizenship to 600,000 persons while Sri Lanka 375,000. However, in the process it was opposite. In 1965, Dudley Senanayake’s ‘hath havula’ government, S. Thondaman and V. Annamalai had become nominated MPs and S. Jesudasan became a Senator for mere reason they opposed Sirima-Shastri Pact. In 1970, under the United Front Government A. Aziz became an appointed M.P. The 1972 Republican Constitution abolished the appointed member system. Thus in 1977 general elections S. Thondaman was elected as the Third Member of Nuwera-Eliya Maskeliya seat representing a community that lives in several districts. This showed that for a quarter century the plantation community did not have the opportunity to elect a single member on their own. However, in 1994, when Chandrika Bandaranaike Kumaratunga became Prime Minister she had to survive with one vote in the 225-member House. That one vote came from the Upcountry People’s Front leader P. Chandrasekeran who was elected from Nuwera-Eliya-Maskeliya constituency. He became the Deputy Minister and later S. Thondaman also joined the Government and appointed as Minister. It was in 1970s the estate schools were taken over by the Government and the free education for the plantation community could be able access for higher education. Still I could remember that in those years according to standardization 14 graduate appointments were given to the plantation community. But it was so difficult to find that small number as there were not enough graduates or lack of citizenship. The present situation is far different. Under President Mahinda Rajapaksa’s Government the education of the plantation community has considerably improved. For example, from Hatton Highlands College alone was able to sent 32 students to universities out of which 10 for medicines. Advanced Level classes have been started in the plantation area schools. President Mahinda Rajapaksa had given two ministerial berths and appointed several deputy ministers from this community. Even with the war situation he allocated 200 million rupees for various development activities in the plantation sector. More than one thousand teachers and other public servants had been appointed. New houses for the estate workers are coming up. 2,700 kilometres of roads had been constructed during his four years rule. More than 125 nurses who were trained would be appointed to the estate hospitals taken over by the government during the incumbent President’s administration. When the country celebrates its 62 years of independence the plantation community is proud that President Mahinda Rajapaksa was re-elected and hope that this would give a boost to the development of plantation community.